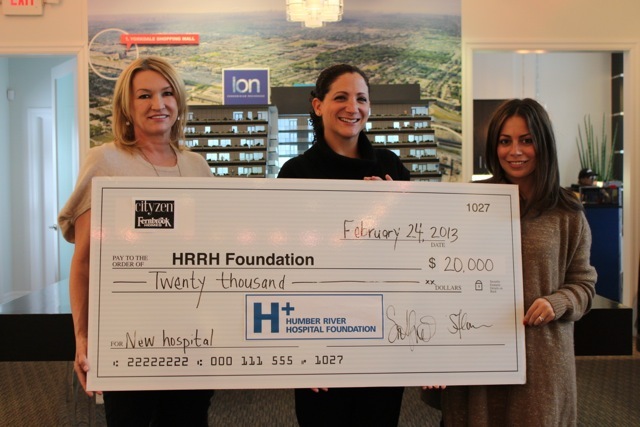 (L-R) Heather Hurst, CEO Humber River Regional Hospital Foundation; Sharon Florian of Cityzen Fernbrook; Sara Crignano of Cityzen Development Inc.
That’s a mighty big cheque! 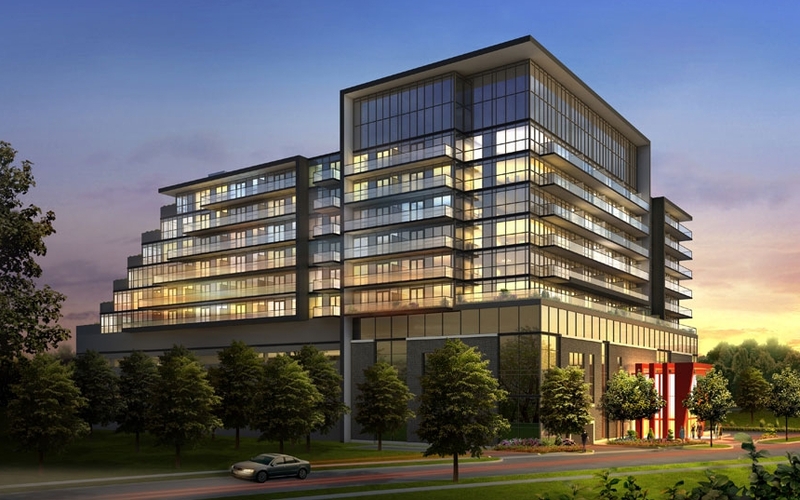 It’s easily one of the most interesting partnerships we’ve come across: Ion Condominiums, a new condo development at Keele and Wilson, joined up with the Humber River Regional Hospital to raise funds for its construction. Thanks to efforts by the condo’s developers, Cityzen Development Group and Fernbrook Homes, the grand total raised came to $20,000. The new hospital is currently being built just across the street from the 10-storey condo. In order to assist members of the hospital staff and their families in purchasing new condos at Ion, the buyers received a cashback upon the closing of their new homes. At the same time, a donation to the hospital was made for each individual that purchased. The total was presented to Heather Hurst, CEO of the Humber River. “We are very grateful to Cityzen and Fernbrook for their generosity and great support of the new hospital. It has been an honour to have worked with them on this program over the past year,” she said. The first residents will be able to move into the building in 2015. Each suite will come with panoramic windows, deep soaker tubs and cultured marble countertops. Amenities include an outdoor terrace with natural gas barbecues, a party room and a gym and yoga studio. The 200-unit undertaking will feature everything from 300-square foot bachelor pads to ample-sized two-bedroom suites that measure 915-square feet. Prices start at $189,900. For more information contact info@cityzen.ca or 416 633 2737.